I am in the process of knowing what Elijah wants, needs and anything that will make both our life easier. He’s beginning to get crazy. Yes. You read it right. I don’t know what to do with him. If only I can carry him all the time, I will. I wish I am a kangaroo. When I am about to cook food, He’ll cry so loud. When I am about to do something that he may not see me for seconds he’ll cry like I am pinching him secretly. He’s wild. Too much breastfeeding leads to craziness. LOL. I found this magic food, a not so helpful junk food that makes Elijah forget that I am his mother for one minute. It’s what you called krimstik. A chocolate inside a long plastic. 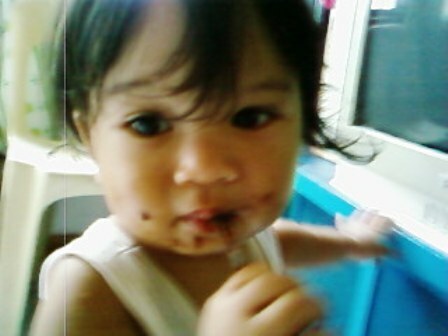 He may not cry while I am doing household chores when he is eating krimstik but believe me it doesn’t help at all. He is so dirty after eating and he puts his hand full of chocolate everywhere. That only means another set of cleaning.